checking for hints or clues. petals stretch under the sun. a day –enough to slake the longing. push upwards to the light. than just a delicious preserve. Will I find time to welcome the universe? I am greeted by my grandson. hands help water the plants. mist high his orange hair. digging deep to loosen earth. How I wish I could tell you all I know of my garden. How I wish I could know yours. Artist Statement: I am inspired by the turning of nature’s seasons, especially spring and fall. To see life rise from the dead ground, buds appear on drab sticks, a purple crocus peeking through winter snow. When autumn breezes rattle through leaves, I feel an excitement, as if heavenly messengers are visiting, whispering thoughts in a language only my heart understands. Golden afternoons in the garden are a blessing. Pulling weeds becomes a meditation on what I need to pull from my own life—to make room for growth. I want to capture the nobility of ordinary life, to shine light on this spiritual journey. 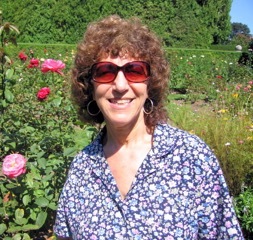 Bio: Since retiring as a library media specialist, Harriet Pasca-Ortgies has been able to pursue her childhood passion for poetry and the arts. She embraced the Bahá’í Faith at an early age and is deeply committed to sharing its healing message of unity and peace. Harriet enjoys growing vegetables and flowers and creating a backyard natural habitat, which keeps her very busy. She is married and has two grown sons, both teachers, who practice the arts.